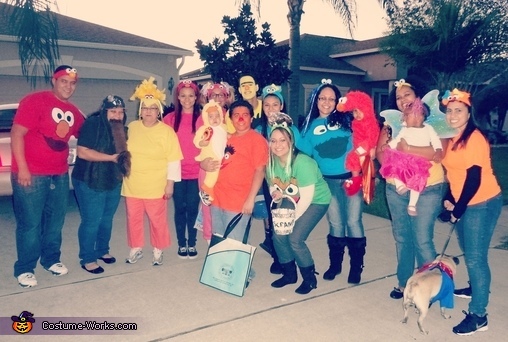 L to R: Elmo, Snuffleupagus, Big Bird, Telly Monster, Rubber Ducky, Ernie, Bert, Rosita, Oscar the Grouch, Cookie Monster, Elmo (again), Abby Cadabby, Zoe, and Super Grover! This homemade costume for families entered our 2012 Halloween Costume Contest. The idea started with my nephew who loves Elmo and the rest of the family wanted to join in! We had cousins, sisters, aunts, nephews, babies, a grandma and a dog join in on the fun as we trick or treated and sang from house to house. We bought t-shirts, made Homemade headbands, and painted our faces! The headbands are made of sewn strips of t-shirts, decorated ping pong balls, feathers, yarn, and lots of glue.